I heard of this chain a couple of times in the past and the main reason I stopped in was because I was not only starving, but also heard that their sauces had “Award Winning Flavors.” I did not know what to expect from the place until I got there – where I realized that it was the same basic concept as Wings To Go (which we all know I dislike), but I didn’t want to let that to skew my view. Everyone gets a clean slate as soon as I step through the door, and in this case, I was hoping they would bring the wing. It was clear that this eatery was primarily made to be a take-out facility, though they did have a couple of tables for those who chose to dine in, which in this situation was me, so I did. The dining area was a lot larger than a typical take-out wing joint and was surprisingly clean and comfortable. I ordered my food and took my seat where I indulged in a little soccer that was playing on the TV (side note: not really my thing, and I never really watch, but man those guys were good). I ordered the 10 piece which was a great bargain at $6.99, but when my order was ready and I brought them back to the table, I started to understand why they were so cheap… These things were downright small, probably the tiniest wings I have ever seen. I’m glad that I opted for the side of fries because I practically inhaled the wings in a matter of moments and needed SOMETHING to fill me up. It was a shame, too, because the chicken was promised to be “Always Fresh, Never Frozen,” and it completely lived up to that statement with flying colors; the meat was a decent tenderness, juicy, and came out of the fryer super hot… I just wished there was more of it. Out of the 24 flavors that they carry, there are really 4 that are Buffalo based sauces: Mild, Medium, Hot, and Suicidal. I chose to get the Medium with a side of Suicidal to see how much heat they both packed, and to be honest, the Medium didn’t pack much. But HOLY HELL the Suicidal kicked my taste buds from here to next Tuesday it was so insanely hot. The main ingredient tasted like liquid heat, and even though I was told that there was also a blend of extra spices, I sure couldn’t taste them with my mouth on fire like it was. This is the main reason why I normally order a Medium when I go out because it gives the right amount of heat, but still allows you to taste the flavors. Which is the one thing that the Medium here did have… some flavor. Though it lacked heat, the sauce brought a buttery, sweet, candy-like quality to the wing that was great… but in small doses. Too much too quickly, and your stomach will start to complain. The complete dish at Planet Wings was a little disappointing, mainly because of the size… but you get what you pay for. The wings were not bad, but I wouldn’t go out of my way to hunt them down either. 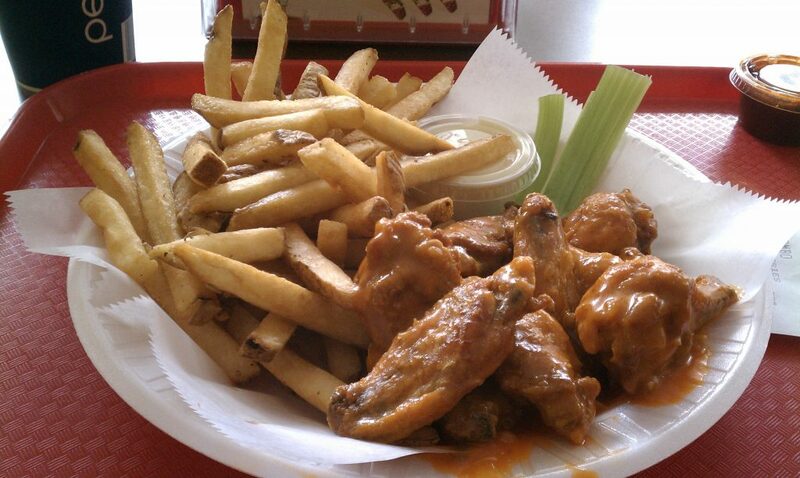 There are a lot of better places to pick up great wings, however, if you are only looking for a quick wing stop on your way home, then they might just do the trick.